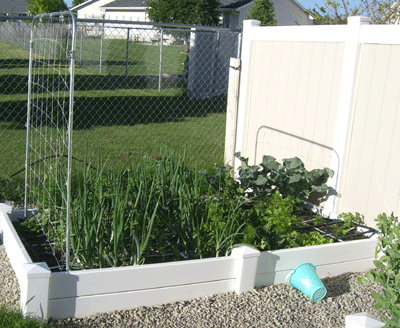 From left to right, I am growing cucumbers, onions, carrots, onions, broccoli, parsley, lettuce, and cilantro. 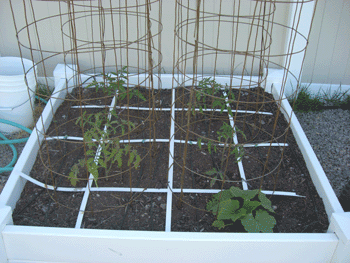 I finally got my trellis installed for the cucumbers, and they have all emerged! This garden bed has my peas and potatoes. The potatoes are doing wonderfully. 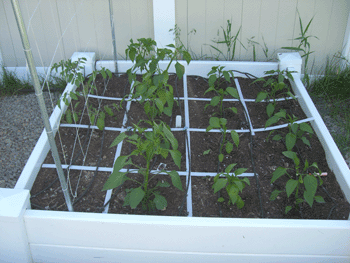 I’ve had to tie the peas to the trellis, because the crazy winds keep blowing them down. One of my tomatoes snapped in two, so I had to replace it. But I got my cages installed, and you can see my beans on the right. The beets on the left have popped up, but they are still tiny and hard to see. 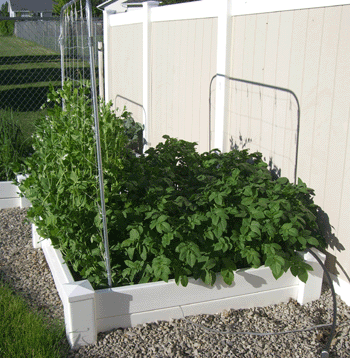 My gardens on the east side are a little boring–mostly tomatoes. But I have a volunteer in the middle box–I’m not sure what type of squash or melon it is. I’m going to let it grow and see! 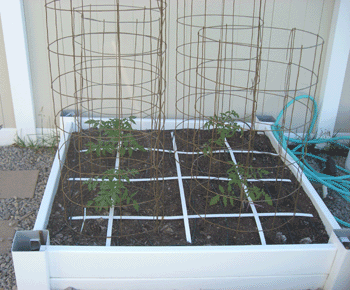 I did get all my tomato cages built and installed, my vertical trellis installed, and my peppers planted! It was a really productive week for me in the garden! 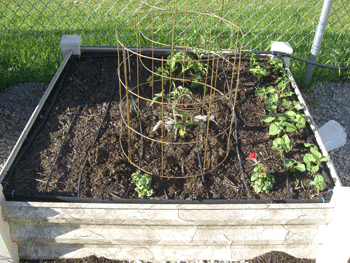 I have everything planted and installed, so I’m officially in the “watching my garden grow” phase.